There are still a number of warm summer nights ahead and plenty of time to dine outdoors. I love to serve cold soups to my guests as a first course and have five different ones to share this week. 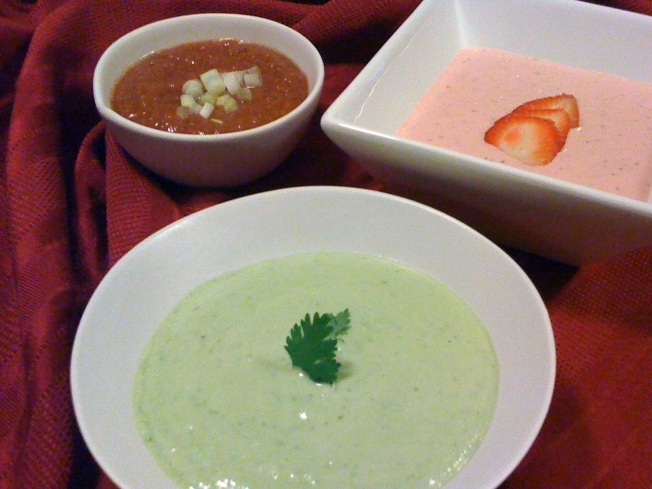 The gazpacho and blue raspberry are soups I’ve served many times. The others are adaptations of recipes that I’ve gotten from my wonderful facebook friends. One key thing to remember with serving chilled soups is to also chill the bowl beforehand. It makes a nice presentation and keeps the soup nice and chilly. Make a relish by chopping the 1/3 piece of seedless cucumber and 1/2 of one avocado into a medium dice. Toss with the lemon zest and a pinch of dill and tarragon. Seal in an airtight container and set aside. Cut 1 tomato into large chunks. Place tomato in a blender with 1 cup of tomato juice. Add 1/2 each of the cucumber, onion and green pepper. Add 1 jalapeño pepper. Blend ingredients until smooth. Transfer to a large bowl. Add remaining tomato juice, olive oil, red wine vinegar, balsamic vinegar, Louisiana hot sauce, cumin, dill, chili powder, Worchestershire sauce, salt and pepper. Stir together ingredients, cover and refrigerate for 2 hours or longer. Meanwhile, chop the remaining 1/2 each of cucumber, onion and green pepper and place in separate small bowls or serving dishes. Chop remaining jalapeño pepper and place it in a small bowl or serving dish. Place chives, sour cream and croutons in serving dishes as well. Place raspberries, yogurt and mascarpone cheese in a blender and blend until smooth. If you aren’t a big fan of the seeds and blueberry pulp, you can strain the mixture through a fine mesh strainer. Cover and refrigerate until ready to serve. Meanwhile, chill individual small serving bowls. To serve, squeeze lemon juice into mixture and pour into serving bowls. Top with a few raspberries and blueberries and garnish with fresh mint. Put strawberries (except the two or three reserved ones), sour cream, mascarpone cheese and vanilla in a blender and blend until smooth. Add remaining ingredients and continue to mix until well blended. Refrigerate for at least 2 hours. Serve in chilled bowls topped with thinly sliced strawberries and a sprig of fresh mint. Stand each of the 4 ears of corn on its end and, using a sharp knife, cut the kernals away from the cob. Set corn aside. Saute onion, garlic and half of yellow pepper in a pot over medium heat until tender. Add potato half of the corn, cilantro and broth and bring to a boil. Simmer for 20 minutes. Remove from heat and blend in small batches being careful to not overfill the blender and risk spilling the hot mixture. Return mixture to the pot over medium. Add remaining corn kernals and yellow pepper and simmer for about 10 minutes. Season with salt and pepper. This soup can be served hot or cold. Thin the soup with a bit more stock if necessary. To serve, rub a tiny bit of olive oil on the two remaining ears of corn. Roast them on a grill or under a broiler until they have a light char. Remove from the heat and cut the kernals away from the cob. Mix with the tomatoes and rosemary and top individual serving bowls of the soup. Thanks to all my Facebook friends for their recipes and suggestions. If you have any questions or comments, please send me an email at wayne@waynesweekend.com or follow me on Facebook.